Topics covered in the new publication include the evolution of national regulations concerning the recognition and compensation of asbestos-related diseases, health measures for at-risk workers and background information on the uses, properties and hazards posed by asbestos. Collaborative exchanges which took place in 2012 and 2013 with dozens of national authorities and experts during the investigations progressed the social dialogue on asbestos in target countries and furthered ties between asbestos activists in trade unions and victims' organizations and civil servants, academics and other professionals. Despite the fact that in some of the countries surveyed, information was either unavailable or inaccessible, the publication of this report marks a milestone in Europe's asbestos discourse; by highlighting industrial practices, economic activities and the consequences of human exposure to asbestos in countries where, as recently as 2010, the production and use of asbestos remained legal, the research findings counterbalance industry propaganda, which, even now, maintains that asbestos can be used safely. 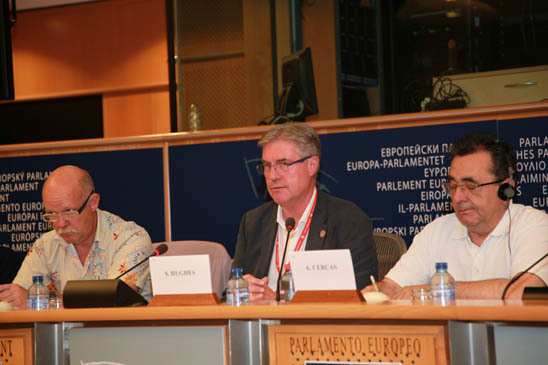 From left: Lars Vedsmand, BAT-Kartellet DK, MEP S. Hughes and MEP A. Cercas at 2011 Asbestos - Still a Killer Conference in European Parliament, Brussels. Within the region, there is a striking diversity in the designation of signature asbestos-related diseases as prescribed industrial diseases with the Czech Republic and Slovakia having recognized asbestosis in 1947 while Estonia and Cyprus waited until 2005 and 2007, respectively to do so.9 Measures for collecting data on the incidence of asbestos-related diseases also vary considerably from country to country: in Estonia, there is no system for recording such data while in Poland this information is available free of charge from the website of the Nofer Institute of Occupational Medicine. While no cases of asbestosis, mesothelioma or lung cancer have ever been recorded in Bulgaria or Turkey, in the period 1976-2011, Poland recognized 2,863 cases of asbestosis and 297 cases of mesothelioma; between 1998 and 2013 Slovenia recognized 448 cases of asbestosis and 128 cases of mesothelioma. One of the few areas of consistency in the region was under-reporting of asbestos-related and other occupational diseases. Support for asbestos victims' groups. 2 EFBWW Asbestos Material for Trade Unions. Asbestos  Still a Killer. 4Kazan-Allen L. Europe's Asbestos Catastrophe. November 9, 2012. 5 Committee on Employment and Social Affairs Hearing. September 18, 2012. 6 European Parliament demands the eradication of asbestos contamination. March 14, 2013. Also see: European Parliament resolution of 14 March 2013 on asbestos related occupational health threats and prospects for abolishing all existing asbestos (2012/2065(INI). 8 In 2006 Eurogip published Asbestos-related occupational diseases in Europe. Recognition, Statistics, Specific Systems which examined the situation in 13 countries in Western Europe. 9 Although mesothelioma is recognized by each of the countries surveyed, judging by the situation in Turkey  where even people killed by accidents at work struggle to receive recognition or compensation  it remains unclear whether this recognition necessarily brings benefits to the injured.